I recently drove past the Indiana State Fairgrounds, like I have been doing many times lately, and instantly noticed what had not been there only several hours before….the first signs of an impending State Fair! I always get excited about the state fair, but this year I feel like I will have more of an opportunity to enjoy it. No classes, a little extra spending money, plus my nephews will be in town for the fun for the first time in years. I haven’t really been creating much lately, but I’ve thinking about entering something into the art show. I haven’t entered the contest since I won a first place ribbon by default four years ago. I just happened to enter my photos into an obscure category that only one other person had entered. And since my photos were better than his, I got a first place ribbon! That’s marginally better than the time I got a bronze medal in a sparring match after getting beat by the only other two contestants in my ranking. Regardless, I still keep my medal and my ribbon with pride. You can’t win by default if you never try, right? So, what do you think? Are there any photographs (of my own) that I have posted that you think might be of photo contest quality? Or, do you have any ideas for drawings or projects I could start on? I still have a couple of months to come up with something, but as of now I’m pretty short on ideas. In my experience I’ve noticed that the state fair artist judges tend to go for perfectly executed landscapes and pretty pictures of the like, but fortunately I’m not too interested in winning. I just like the idea of throwing something a little different into the mix. It may not look like a whole lot, but it went a long way. 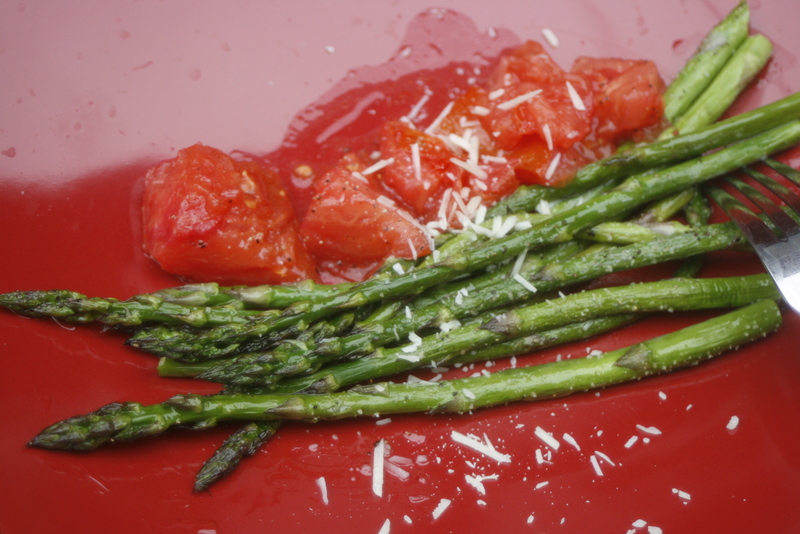 The first night I dove right into the asparagus, roasting it up in olive oil with one of the tomatoes. Completely unrelated to my cooking capabilities, it tasted absolutely amazing. Score one for the locals. 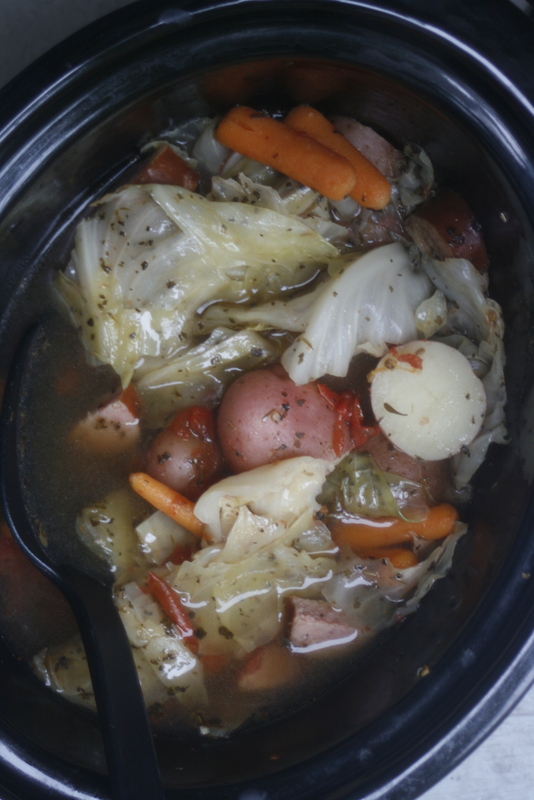 The next day, I bought a pound of kielbasa and some chicken broth, and cooked up a yummy little stew. I know, baby carrots are anathema, but I’m still making progress in that department. This stew only used up half our produce and lasted us two days. On the fourth day, we ordered pizza. 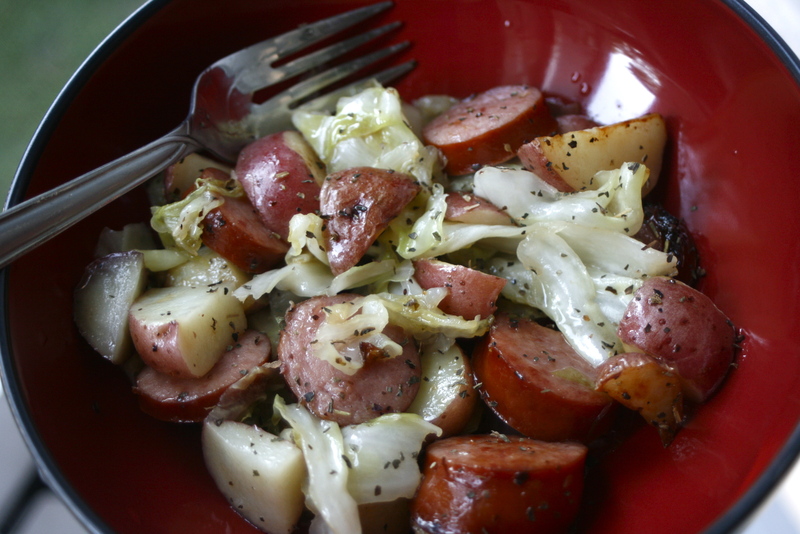 Finally, tonight I pulled out the last of the cabbage, potatoes, and kielbasa, and fried it in olive oil for a different effect. And so concluded our first venture into locovorianism (if it shows up in a google search, then it’s a word). It was fun, healthy, undoubtedly delicious, and inexpensive considering that $25 of groceries fed us for four nights. And perhaps best of all, it motivates me to pretend that I can cook. We hung the swag lamp this weekend. 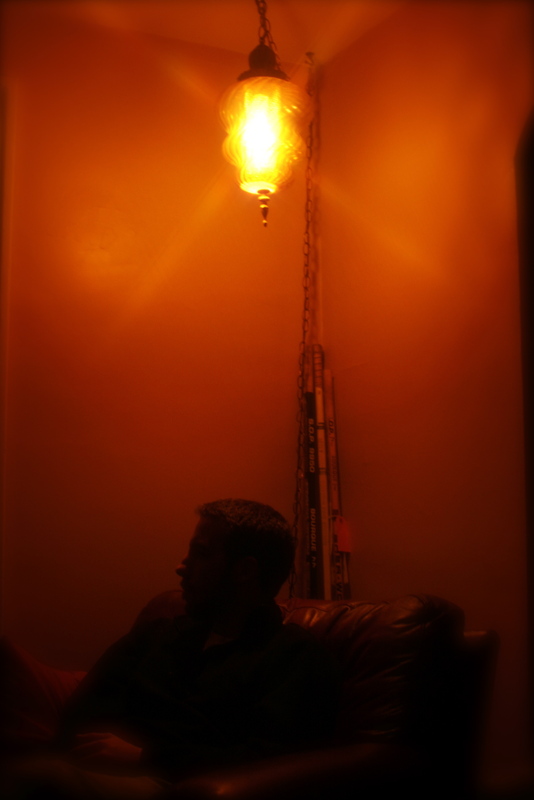 I found this lamp in a rental house one day. The former tenants had been gone for over a year, abandoning half their belongings for good. Among some really cool (but unfortunately molded) vintage clothing, I picked out and instantly fell in love with this amber glass swag lamp from a bygone decade. Now it’s part of my history. I’ve heard that swag lamps were first produced in the 1950s, but became very popular in the 70s and 80s. They do tend to have a bit of a 70s feel to them (not that I’d really know), but there is something almost Victorian about them with their intricate metal accents. Being a young and therefore mostly objective lover of swag lamps, they seem to have a timeless quality to me that is not hindered by my association of swag lamps to any particular decade. I just like them. I own two working swag lamps and two “project” swag lamps that will probably never shine light so long as I still keep them around, promising to one day fix them. I don’t know what it is about them that compels me to collect and hang these luminescent monstrosities. Perhaps because they are so different from anything you can find in the stores today. They’re not in style, but they sell for a pretty penny on Ebay. And it seems that people have a fondness for leaving them behind when they move out of our rentals. I can’t say that I blame them, because they are a pain to lug around and I’ve considered abandoning my own on more than one occasion. Even being a foreign object in my world, the swag lamp appeals to me with some vague sense of familiarity. The colored glass, the ambient glow it casts, and the ancient look about them remind me of something that I must have forgotten. They have a strange kind of nostalgic comfort, like being back in your grandma’s house after a long time away. I can’t really put my finger on it. I do know, however, that my swag lamps add something to my home decor that is not entirely stylish, but undeniably…quirky? peculiar? distinct? And, it makes a really great night light. Not that I’m still afraid of the dark, or anything. I’m finding that it’s not easy to keep up a daily blog. Not impossible, nor even extraordinarily difficult, but not easy. Blogging, you see, takes a certain amount of effort. It’s not just about being able to type. It’s not even only about the talent to put together a coherent or particularly compelling sentence structure. An excellent blog, in my humble estimation, is one that incorporates every possible element into one refreshing experience for the reader. I don’t typically write my blog with my reader in mind. I log onto WordPress and go, doing little more editing than finding the perfect word or correcting unsightly typos. But I still pay close attention to how the blog looks, not just how the words sound. The sentences reflect what I’m thinking at any particular moment, but the rest of the blog is a subtle expression of mood and ambience. The “rest,” such as the typeface, the font size, the banner, the background, the placement of photographs (should this pic precede the text as a preface, or be placed at the end as a punch line? ), the editing of photographs, the variety vs the focus of the blog, the layout of the page…even the margins and the spacing between paragraphs are crucial elements that the conscientious blogger must consider. See, I told you it wasn’t easy. There are a plethora of blogs out there that are less than mediocre, and I’m sure you’ve come across a few in your time. Essentially it shouldn’t matter, as long as the blogger is achieving the level of self-expression he or she desires. But then there are those elite blogs that are simply stunning, whether in form, content, or design, which make the rest of us bloggers blush with envy. I’ve found a few favorites that I attempt to emulate from time to time. These are some of the blogs I hold dear in one way or another, almost like old friends, ever-changing but somehow never unfamiliar. You’ll see what I mean. Made In Mississippi–a classy and understated artist blog. A nice change from in-your-face expressiveness. Color Me Katie–absolutely charming. Who wouldn’t want to be like Katie? She specializes in photographic narratives and collections of uber-happy images. Everything is rainbows and smiles. The Craft Begins–I don’t always get on board with the fashion and style content, but I love the way she (or he?) 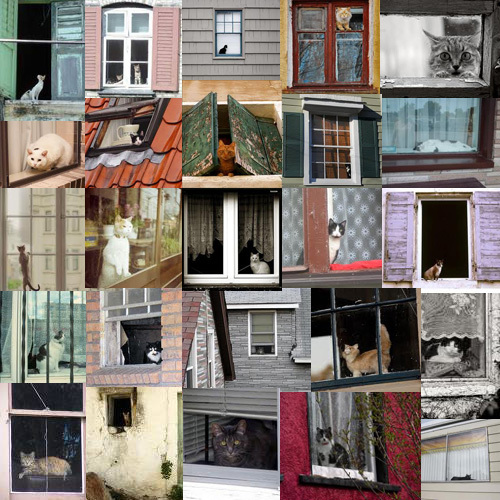 puts together images in grids and clean collages. Very effective! zenhabits–it doesn’t get much simpler than this. Always a great read. 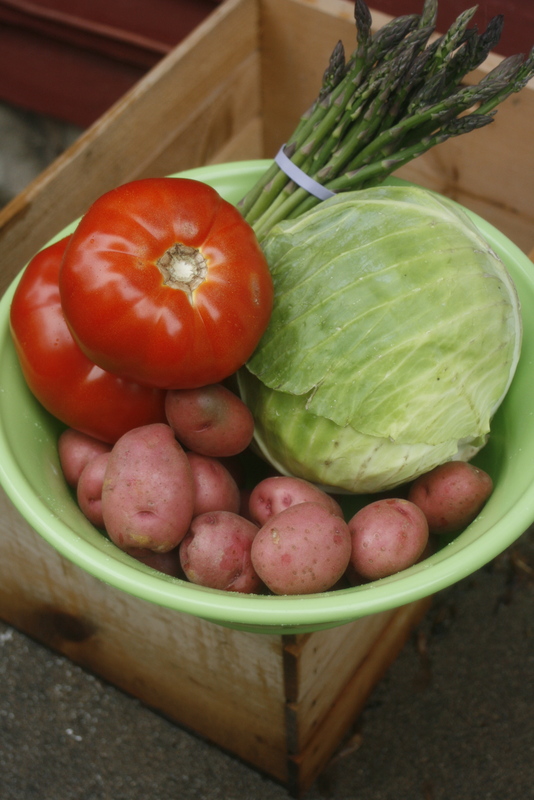 Backyard Bounty–I love the down-home feel to this blog, and of course the content engages me. My favorite part, though, is the background resembling the folded back pages of a magazine. Tongue In Cheek–so visually gorgeous and exotic. Not overwhelmingly so, thanks to the simple gray background and formatting. her three birds–a cute and funky little blog I stumbled upon the other day. I especially like the personality and intimacy this blog exudes. The other day at work, two women came to the door to hand out pamphlets that taught about biblical interpretations of end of the world prophecies. Thankfully, they left their literature and went on their way. I leafed through the pamphlet, which cited various current events as evidence of big things to come. War, famine, pestilence, marital abuse, natural disasters—you know, the things that have been around as long as humanity has existed to know about them. And similarly, humanity has been predicting the end since we have had the mental ability to jump to conclusions. I don’t have any hard historical facts to back up that claim, but the fact of the matter is that we’ve seen this all before, we’ve heard the tales and the predictions, and so far we’re all still here. I’m not just talking about the extremists, either. The rapturists (whatever they are officially called) certainly take it to a new level with their calculated doomsday prophecies. But when it comes down to it, most of us have our own little doomsday prophecy of our own. If it isn’t the rapture, it might be the apocalypse, or alien invasion, or takeover by hyper-intelligent computers, or the evolution of the ultimate antibiotic-resistant bacteria, or global warming. For the less inventive crowd, it will likely involve something like nuclear holocaust. Or peak oil. Whatever the disaster, there seems to be a communal idea that something’s gotta give; that things can’t keep on progressing indefinitely at this crazed pace we’re living. And that may be true; it may not. Who’s to say how far or fast the human race will develop before it meets its demise? Not even religion offers clues as to this. If we’re lucky, we will have advanced to a point where we can get the heck out of dodge (ie., the Milky Way galaxy) before our Sun becomes a red giant and engulfs pretty much everything we know of. But even that is hearsay, and not much worth worrying about. I guess my point in all this is: why fret? Choose your ending, if you will, and do what you need to prepare, be it praying, recycling, avoiding doctors, or digging a bunker in your backyard. But I really see no reason to let any ending consume your life. It baffles me to know some who spend their lives straining to prepare for a conclusion that may never come. And it’s saddening. I admire anyone who dedicates their life to a cause that does not involve harming others, but just remember that you have a life to live, that most of the horrible things in the world cannot be changed by your immediate actions, and that in the end, we’re all going to be swallowed up by the Sun anyway. Been a little down today, and not much feeling like writing, so here’s a little Photoshop play instead. A blue collage for those melancholic days. A few years ago I was a very typical college student, cruising to the grocery store every two weeks or so to stock up on Ramen noodles and soda. Back then you could get 10 cans of SpaghettiO’s for $10, and I would do just that. My diet consisted almost entirely of a mixture of canned processed foods, supplemented with McDonald’s and Taco Bell when I couldn’t find a microwave. I didn’t have the time, the money, or the inclination to eat any healthier. Eating was a chore, and if a grab bag of Cheez-Its and a 20oz. Mountain Dew could get me through another art history lecture, then that was good enough for me. Every so often I would be particularly ambitious and cook—e.g., Tuna Helper or a microwave mac n’ cheese. Since then, my nutritional evolution has been a slow, natural process. I was clueless about food, but started out by eating more fruits and veggies of the canned variety. It was a start. When those handy microwaveable steamed bags of vegetables came out I got hooked, and upgraded a bit. Eventually (and only recently, I have to admit), I started hanging out a little more in the produce section of the grocery store. I stopped buying meat, and things got interesting. My curiosity had been piqued, and I started finding more interesting ways to eat. Unnaturally flat squares of lunch meat were replaced with beans and rice in my shopping basket. Chips and cookies were (mostly) replaced with fruits and old-fashioned popping corn. Even my canned soup staples fell by the wayside as I became more interested in sweet peppers and baby carrots. Little did I know that I had hardly scratched the surface of becoming a food-conscious consumer. When I decided, earlier this spring, that I would put my vet school plans on hold indefinitely, I needed something else to occupy my thoughts and plans for the future. I took to gardening as my rebound obsession. I got involved with a group at IUPUI that was planning an “urban garden” on campus. I volunteered at the Indy Winter Farmers’ Market. The more I got involved, the more intrigued I became. There was so much to find out about. And it all looked pretty tasty. I still feel pretty clueless, but I’m learning by the bushelful every day. Right now I’m knee-deep into a book by Barbara Kingsolver called Animal, Vegetable, Miracle. In truly riveting Kingsolver fashion, the book is a non-fictional account of the author’s pledge, with her family, to subsist for one year only on what they could grow on their farm or could get from other farmers in their county. It might not sound like an enthralling read, but the book is enlightening, to say the least. Barbara Kingsolver’s book focuses on one pivotal action that is inescapably married to the local food movement: seasonal eating. Again, I feel a little silly to admit, but this concept is pretty foreign to me. I mean, I know that you can only buy pumpkins during autumn, and that pomegranates usually show up at the grocery store around Christmas time, but….when is it normal to be eating asparagus? When would anyone not living in California expect to see a carrot or an apple or a zucchini appear on their dinner plate? Take away everything that gets shipped in from distant lands, and just what would be left on the shelves in mid-May?? I had no idea. But through all my reading and researching and getting my hands dirty in my own little vegetable plot, I’m starting to catch on. And like any new discovery, now that I’ve found out about local foods I’m starting to notice it everywhere. Unbeknownst to me, Indy actually has a flourishing local foods scene. It’s practically becoming a style around here. There are farmers’ markets cropping up on every side of the city. You can buy shares in farmers’ crops that are delivered into the city for pickup. There is even a service that will deliver bags of farm-fresh groceries to your front door, year round. It’s amazing what you can find when you know what to look for. My next step in my personal (Local) Foods Movement is, well, to buy some local foods. Now that I’m a working girl I actually have a bit of surplus income to make that possible. Yes, good food is more expensive than what comes in a can on a shelf at Kroger. But it’s worth it. Yesterday Jeff and I stopped in at a place called Locally Grown Gardens, just a mile’s walk from our house. I was surprised at all they had available, especially this early in the season. There were little potatoes, tons of redolent tomatoes, asparagus, cabbage, onions, loaves and loaves of bread, and some really tasty looking pies. The shelves were fully stocked with edible goods from all around the state. It was beautiful. Everything smelled amazing. Unfortunately we were on foot at the time and unwilling to lug home bags of groceries from such a distance, so we promised ourselves we would come back very soon. I may be gastronomically challenged, but I can follow a recipe, and those veggies have a date with my crock pot.